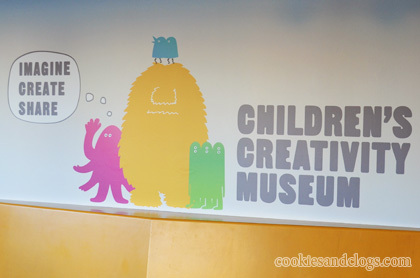 Zeum is now closed but has come back as Children’s Creativity Museum. After over 5,000 guests attended the grand re-opening, another special event was held. 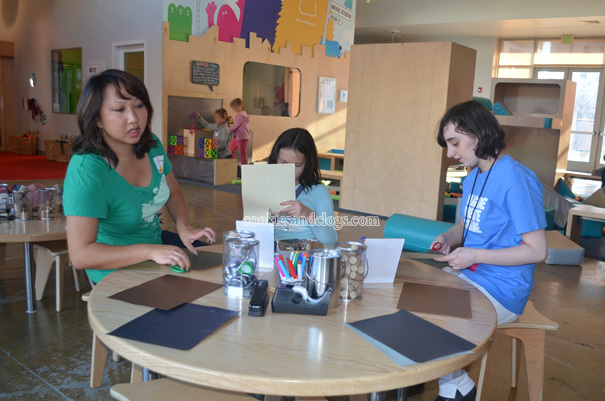 Several local bloggers, including myself, got a private look at the new branding of the museum while getting hands-on at the many old and new creativity stations. Immediately you will notice the new, brightly-colored mascots. While kind of strange, they are very cheery and give the museum something tangible to be identified with. The new name is much longer but people can easily figure out what type of facility it is by just the name alone. Much of the museum remains the same with just a bit of a facelift. 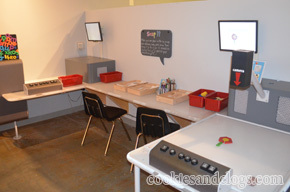 Other parts show a better use of space with new activities to offer and things to discover. My daughter’s absolute favorite area was the DIY (Do It Yourself) area. 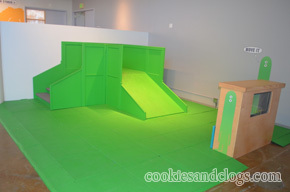 The project being featured at this time allowed you to create your own room/house. This simple idea jumpstarted an overflow of ideas as markers, wine corks, fabric scraps, tape, bottle caps, and stickers were laid before us. The only reason we moved on from here was because it was time to eat and for the planned presentation. 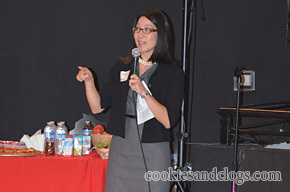 After filling our plates with some munchies, we settled in to listen to the museum’s executive director, Audrey Yamamoto. There was a brief overview of why the museum felt it was necessary to re-invent itself. Up to this point Zeum had been a kind of ‘local gem’ that few knew about and even fewer visited. 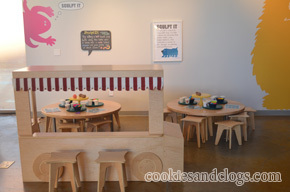 With aims of becoming an established Bay Area family favorite some changes were thought of and implemented. 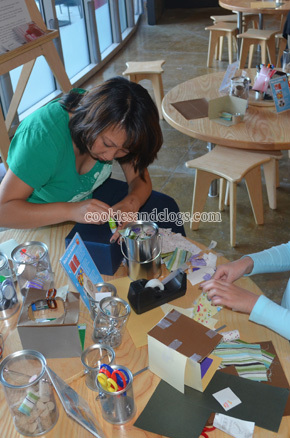 Now residents all over are being invited to learn, play, and create. After that we only had a bit more time to explore the facility. My daughter and I finished our DIY rooms and put them in our cubbies near the front. The staff provided wonderful support and kind encouragement at each area. 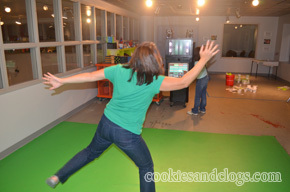 We also had a chance to do a few things that normally have a huge line such as that lovely green screen you see me boogying in front of. I tried to get my daughter to do music video but she had NO desire to sing in front of people, though there was only 1-2 other families there. 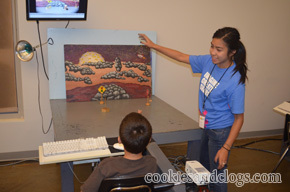 The animation area, where you create your own clay figures and stop-motion animation, is our favorite part but we need a minimum of two hours for that and we only had about fifteen minutes left. 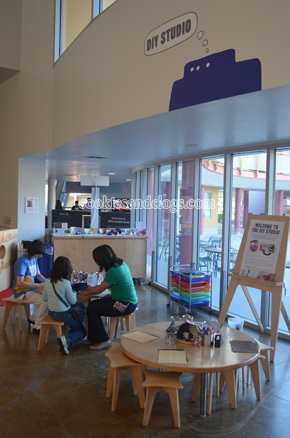 We like Zeum before and we like Children’s Creativity Museum even better. While my daughter is too old to take advantage of their new Early Birdles program, I’m sure she’ll enjoy watching and testing new apps by featured developers during another program. Be warned: Make sure you allow plenty of time for yourselves when you visit and be prepared to have just as much, if not more, fun than your kids! WIN IT!One reader will win a VIP pass to Children’s Creativity Museum (covers admission for up to four people). 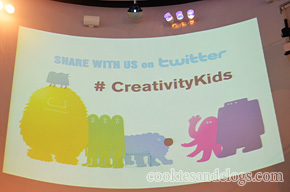 Tell me whether you have ever been to Zeum and who you will take with you to the new Children’s Creativity Museum. Giveaway ends 11/13/11 at 11:59 PST. Open to US residents only. Winner has 48 hours to respond before a new winner is chosen. Skipping Rocks – A Newly Discovered Talent? I would love to win the VIP pass to Zeum – we have never been there and it looks awesome. I would bring my family of 4! I have never been to zeum and the new place looks great! I’d take my 2 boys ages 5.5 and 4 (and my husband!) It looks like a blast!! Would love to win! I never quite understood what “Zeum” was and so never got around to going; looking forward to exploring this further! I have never gone, but I would love to. I would take my niece and nephew. I like Cookies and Clogs on FB. I follow @cookiesANDclogs on twitter. We used to be members of Zeum but we let that lapse a year ago. 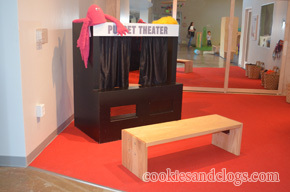 We would love to visit the Children’s Creativity Museum in its new incarnation. We would go as a family, myself, my husband and our 8-year old son, Nate, and we’d also bring a friend of Nate’s. Thanks! We’ve been to Zeum twice in the last five years, but my kids were a little too young at the time. I had made a mental note to return when they were older, but I had forgotten! ; ) We would love to go, and would use the pass for our family of four (kids are now 2 1/2 and almost 6). Thanks! I’ve never been to Zeum. I’d like to take my home-schooling son and a friend with my husband and me. I have never been to Zeum. I would like to take three of my boys with me. I have never been to the Zeum and would take my son, daughter, and husband. Looks amazing!! I’ve never been to the Zeum but heard lots about it but now that it has Re-opened, I’ll definately take the kids. We have never been to Zeum and have only just heard about it from a friend. It sounds fun and exciting. I’ve been looking for something new and creative to do with my children. If I won a pass I would take my husband and two children. I’ve never been. I would love to take my 6 yr old boy and 12 yr old daughter. They’re both super creative.. this would be right up their alley! I have never been to Zeum and I would take my husband and my baby girl there ! I have never been. I would take my sister, my neice and my son when we go to San Fran in a few months to visit.